A simple, environmentally benign methodology has been developed to synthesize some bromoorganic compounds which have potential as antimicrobial agents. The required compounds were obtained through microwave (MW) irradiation, on-water reactions and using cetyltrimethylammonium tribromide (CTMATB) as the bromine source. The high yield of the product could be achieved within short reaction times, thus representing the main attribute of the present synthetic approach. The compounds were evaluated for in vitro antibacterial activity against Escherichia coli, Klebsiella pneumoniae, Staphylococcus aureus and Bacillus subtilis. 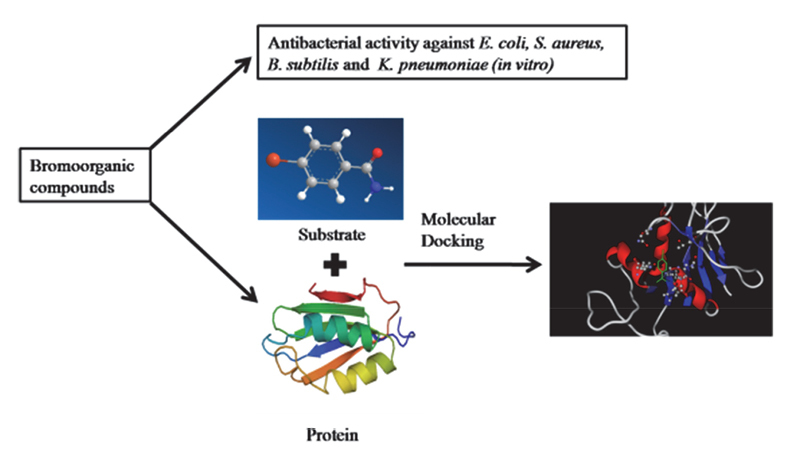 Further, in silico studies were carried out to elucidate the interactions of the compounds with the bacterial proteins.